In several weeks (8 June) I’ll be sitting down at the historic Leeds Library (7 pm) with my friend Chris Nickson, engaging in a conversation about our work and our friendship. I’m grateful for this opportunity to share the stage with a friend whose work I so admire. We share a love for the north of England, past and present, and for talking shop. Our almost daily email exchanges are chronicles of our work and inspiration. We both explore the political landscape of the past in our writing and how it mirrors our contemporary concerns. I might seem more overt in my politics because I include the politics of the realm in my books, but we both aim to show how the wider issues affected the people far from Westminster. Trust me, we’ll entertain you with our chatter. You’re not familiar with Chris’s book? 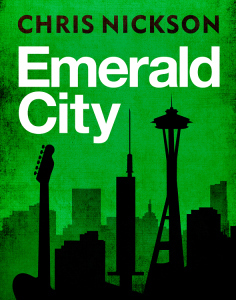 Most of Chris’s crime series are set in different eras in Leeds, although he’s also set short series in Seattle and Chesterfield. Let me just say, I highly recommend all of his books. You are in for a treat. 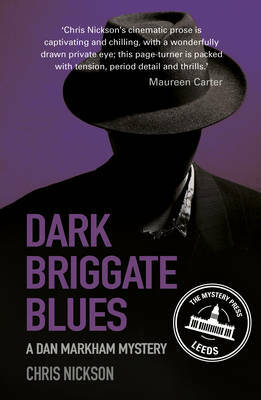 His most recent published book is the fifth book in his Tom Harper series, On Copper Street, which was named by Booklist as one of the best crime novels in the past twelve months. Congratulations, Chris! (Yes, it is that good.) The Tom Harper books are set in Victorian Leeds. Although Tom is a great character, I am always eager for scenes with his wife Annabelle. You’ll know why when you read the books. 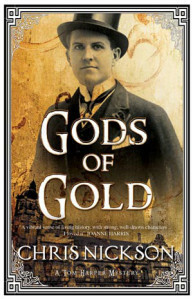 Begin with the first, Gods of Gold. Three years ago I introduced Chris on this blog, talking about how we’d lived in so many of the same places, but never at the same time. Though we’ve since discovered that’s not quite true, we were in Seattle at the same time for a short stretch–we just didn’t know it! It wasn’t until he had returned to the UK that he contacted me. And we haven’t shut up since. If you haven’t yet discovered Chris’s books, let me entice you with some samples of his writing. Now that I think of it, his books beg to be read aloud. 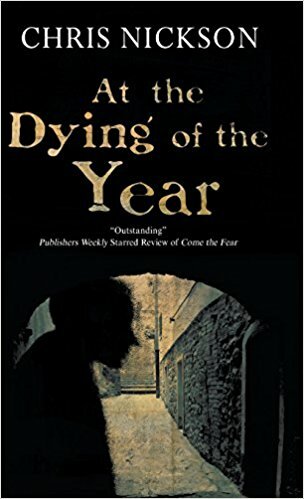 Chris does far more than simply choose a time and place in which to set a mystery, he recreates that time, researching the cultural history as well as the political history, walking the streets. He has a knack for knowing just when to add words common at the time, yet avoids the danger of slowing down the action with dialect. He has an ear for what will bring the scene to life. You can see why I’m looking forward to our conversation at the historic Leeds Library on 8 June. Come join us! Ticket info here. Thank you, Leeds Big Bookend and The Leeds Library for sponsoring this event! 8 June, 7-8:30 pm Leeds Library, Leeds Big Bookend is sponsoring In conversation with Candace Robb—my friend and fellow historical crime writer Chris Nickson will be talking about our craft! For What It’s Worth… a workshop exploring the late medieval York setting for my books and the types of objects one might possess in the city for which people may steal (or kill!). 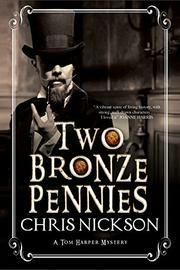 It’s my great pleasure to welcome my friend Chris Nickson, author of the critically acclaimed Richard Nottingham series set in 18th century Leeds that began with The Broken Token and holds the honor of having received a starred review in Publishers Weekly for all six volumes. He also writes a contemporary series set in Seattle (Emerald City, West Seattle Blues), a (so far standalone) medieval mystery The Crooked Spire set in Chesterfield, and a new series set in 19th century Leeds–Gods of Gold will be released in late August. As you’ll learn in the following conversation, Chris started out in journalism. Chris and I have lived in the same cities twice, but we haven’t yet met. Our friendship has grown as we’ve read each other’s books and communicated online. I now count him as one of my closest confidants about the writing life. And you’ll see how much we enjoy talking shop with each other. What began as a simple Q & A, with me the questioner and Chris the respondent became a true conversation, which we’re sharing between our blogs. Q: What draws you to the mystery genre? A–Candace: I love how the investigation of a crime takes me deep into the daily lives of the people, how they interact, and with whom, which provides a glimpse into how the community works. So it’s a cultural exploration. It’s pushed me to imagine in detail how a medieval community worked. I also love exploring the secrets we all hold close, how an investigation threatens these secrets. A–Chris: I think that for me, it’s the ideal of this moral framework to the story. In many ways, it’s simple: there’s a crime and it has to be solved. But within that, there are all sorts of complexities, and the choice between moral absolutes and all the shades of grey between black and white. Conflict is the essence of any book, of course, but this superimposes something on that and gives parameters in which to work. And yes, you can have the community as a very vital part, because crime is social – or anti-social, so it functions within that society, and we need to know that the society/community operates – and different levels and classes operate in different ways. So what seems constricting actually opens so many possibilities. A—Candace again, in response: You’ve touched on something in your response that I appreciate more than ever about the crime genre after writing two non-crime novels back to back, and that is the simplicity of the form: there is a crime and it must be solved. Yet there is immense freedom within that form. The central conflict is clear, a guiding principle, but each person brings his or her unique combination of ethics and self-interest to the investigation. 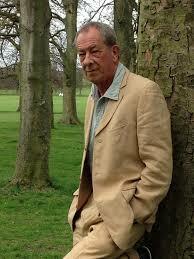 Q: In the Richard Nottingham series you vividly portrayed Leeds in the 18th century. You were raised in Leeds, and now, after completing the Nottingham series, you’ve come full circle and are living there once more. And writing about it. What is it about Leeds that inspires you–and called you back? I know this is a very open-ended question, so just take it where you’d like to go with it. A—Chris: For me, since I was born and raised here, it seemed that I know Leeds in my bones, in a way I’ll never know anywhere else, even Seattle where I lived for 20 years (and have written about). I could feel it and understand how the people would act. And I’d become a student of Leeds history, I’d grown to love it and acquired a decent library about the place. 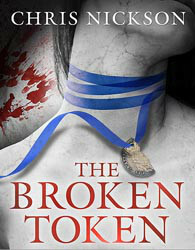 The Broken Token, my first novel, was a sort of love letter to Leeds (curiously, I feel the same way about Emerald City, my first Seattle book), and it grew from there. It remains an inspiration, especially now I’m back here; I realized last week that I’ve written two books set in Leeds since we moved back here last September, and I’m working on a third. I’ve covered the 1730s, now another series set in the 1890s, a standalone set in 1954 and another work in progress in 1971. It’s a chance to explore the way a city changes and grows, really, and how the people who inhabit the place change – or in many cases, don’t. As to what called me back…I moved back to the UK in 2005, but chose not to live in Leeds then, although I was here regularly to see my mother. Since the first novel was published I’ve come back regularly, just to walk around and feel the place, or to do events. When my partner said she was taking early retirement, as a joke I suggested we move to Leeds. Her daughter went to university here and stayed, and suddenly it seemed like a good idea to her. And now we’re living a mile from where I grew up, literally next to a 700-acre park, across the fields from where I went to school. It was odd at first. I know this area so well that I often seemed to be walking with the ghost of my teenage self. But I’ve sloughed that off, and I love living here. I never expected to come full circle, but it’s one of the best things I’ve done (and my partner loves it here, too). A—Chris: I’ve been a music journalist for 20 years, and for several of those I had to produce a lot of work. I also wrote quickie unauthorised bios, which had to be researched and written in a month. So there was the habit of getting it right – or close – first time as there wasn’t time to be artistic. I suppose I brought that to my novels without thinking. As to the focus, that might just be the way I think, I’m not sure. I write every single day, no days off at all, generally 1,000 words, starting at 5.30-ish in the morning, so I have time for my paying work. If I have more time I’ll do a little more. Currently I’m going back over a book, suggestions from my agent and editor before it goes on to my publisher, so I find time to cover 30 pages of that a day, too. All I do in a book is write down the movie in my head, that’s it. These people, the places, are utterly alive to me. I’m there with them and just taking it all down. Response—Candace: Now, even more in awe of your productivity, I’ve been inspired. For the past two days I’ve ignored email and all other tasks until writing 1000 words. Looks as if I should dedicate the 11th Owen Archer to you! Response –Chris: Now that would be an honour! Q—from Chris: You’ve been an influence on my writing. I first discovered your Owen Archer books in the Seattle Public Library, originally not knowing you lived there. And I felt certain you were English, you captured the speech patterns perfectly. But the thing that really caught my attention was the fact that the personal lives and relationships of the characters were as important as the mystery itself. Was that a deliberate decision on your part, or did it just happen. I love the lives and loves of my characters, and even their losses, because it makes them more human. And while most detectives are loners, the reality is that most people have families of one sort or another. The only rule I made for myself was that anyone could die, even a major character – just like life. A—Candace: That I’ve been an influence on your writing is something I treasure. And on top of that to say that I capture British speech patterns so well. Thank you! As to whether it was a deliberate decision on my part to develop the personal lives and relationships of the characters, the answer is no, but only because it never occurred to me to do otherwise. In fact, the crime in the first “Owen Archer,” The Apothecary Rose, is all about Lucie’s past, and throughout the book Owen is brooding on his own past and his need to start over. The relationships are what intrigue me and keep me engaged. They add texture to the story. The interactions among the characters are not only fun for me—Owen and Thoresby sparring, Alisoun pursuing Magda Digby, Jasper’s attachment to Brother Wulfstan, the developing affection between Michaelo and Thoresby, Lucie’s softening toward Sir Robert—but also, I use the relationships to show the effect that crime has on the investigators as well as the victims. You do that so well in your books. As for your rule that anyone can die, even a major character, I appreciate that in your books. I once proposed a plot down the line in which someone very central to the series dies and my British editor choked on her espresso and asked me to swear I would never, ever kill that character. Oh, wait, she’s no longer my editor…. Response – Chris: It can be heartbreaking to kill of a central character, and it’s given me real pain, true emotional pain. But I think it’s a better reflection of real life, and it can come as a jolt to readers, which isn’t a bad thing. Q: When you’d finished your first book, were you already thinking it could be a series? A—Chris: I never gave it a thought. It simply was there, a book, and I was happy. Then, when my publisher said, what next, I didn’t know, and the idea of a series began to form. An event kick-started my second book, and from there I was off and running. With mistakes, of course. In my third book I took Richard out of Leeds a little more into the surrounding townships, and I don’t think it worked as well. It diffused the focus. A—Candace: Short answer, Yes. Some background: In the early 90’s an agent told me that standalone crime novels were very difficult to sell to publishers. They wanted series. So when I decided to rewrite The Apothecary Rose as a crime novel, I created a sleuth I could imagine happily working with over time—actually a pair of sleuths, Owen and Lucie. And when St Martin’s made an offer on Rose, they stipulated that they wanted a series. Our conversation continues on Chris’s blog–go to http://chrisnickson.co.uk/2014/05/01/a-conversation-with-candace-robb/ See you there! Please join in the conversation in comments. I just wanted to take a moment to thank all of you for your companionship this past year. 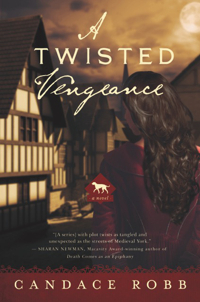 I enjoy sharing with you my fascination with the writing life and all things medieval. I thought it would be fun to share with you some highlights from the year end summary WordPress puts together for bloggers. A Writer’s Retreat was viewed 5900 times in 2013! The busiest day was 12 December, with 111 views–the most popular post that day was Julie Chappell’s The Perilous Passage of the Book of Margery Kempe, though for the year it came in at #5, just behind Jennifer Deane’s Beguine Communities and Medieval History: An Unexpected Treasure?. Considering that both were posted in December, I’d say such posts are a hit. Which is great news, because I enjoy them as well. What were the three most viewed posts? #1, Lincoln Green and Robin Hood (July 2010); #2 Richard I’s Heart Analyzed (February 2013), and The 11th Owen Archer (February 2012). Top commenter is Sandy Neal (thanks, Sandy! ), followed by Chris Nickson, Jennifer Deane, Chris (from Yorkshire), and Bob Newman, for the top 5. Thank you for participating–I love engaging with you. Coming up is a Q&A with Ellie Woodacre to celebrate the publication of Queenship in the Mediterranean. 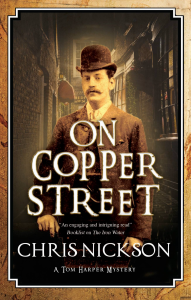 And Chris Nickson and I are kicking around an idea for a Shop Talk “conversation” about writing historical crime. This coming year will see the US publication of Emma’s novel of Joan of Kent, A Triple Knot (29 July)! And Candace really is focusing on the 11th Owen Archer now, A Rumor of Wolves. Warmest wishes for a New Year filled with wonder (and books)!